We are a company of skilled artists with many years of experience. Each of us is available to step in when our specialty is needed. This flexibility allows us to assemble a team just the right size for your project, with the expertise to match. At our first meeting, we’ll bring our portfolio and some samples of colors, textures and finishes to inspire you. Together we’ll explore possibilities and develop your vision into unique designs for your home or work environment. We can pull in existing design motifs or create a completely new look. When we’re ready we’ll call on the talents of our versatile team of artists to make your vision a reality. We know changes in your space can be disruptive, so we’ll go out of our way to respect your privacy and your home. Our clients often comment on what a pleasure it is to work with us. MaryLinda Moss is a graduate of the School of the Art Institute of Chicago. 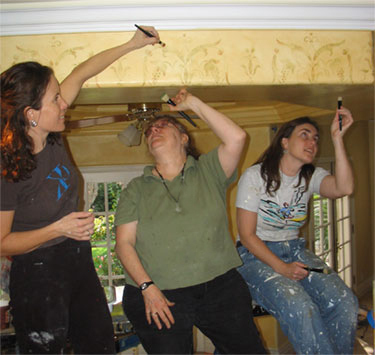 Her extensive artistic training and years of decorative painting give her the combination of knowledge, experience, and artistic sensibility perfect for managing Decorative Elements.